You are invited to step back in time to enjoy our Victorian era bed and breakfast with all the charm, grace and slower pace associated with this enchanting period. Waltz in the parlor amidst the turn-of-the-century décor to the player piano's vintage Tin Pan Alley music. Sip tea from antique china by the Puritan Victorola or wind up the 19th century music box and remember the time you first enjoyed such a delight. For a quiet respite, enjoy the luxury of the library and its wide selection of materials or simply stroll the majestic grounds and admire the picture perfect gardens, coach house and vintage 1931 Chevy Coupe. 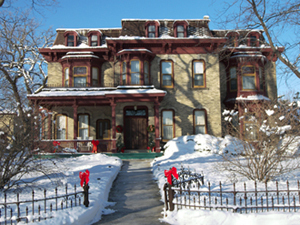 Located in southeast Wisconsin and nestled along the shores of the beautiful Rock River, The Jesse Stone House is open year round. We await the chance to meet you and share the beauty of this elegant mansion close to all southeast Wisconsin has to offer.